"What does JD's stand for?" 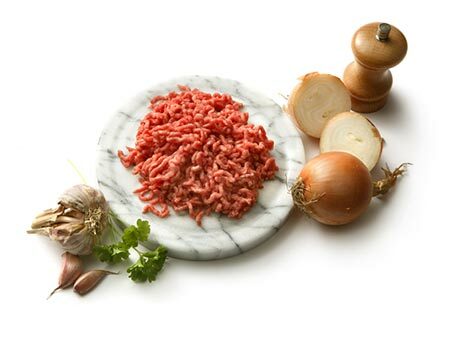 JD's Burgers Proudly Uses 100% Pure Black Angus Grass-fed Beef & Top-of-the-Line Ingredients like our own made JD's Secret Fusion Seasoning for our Chips & Burgers. This combination is what JD's Believes is what makes the Perfect Burger. JD is the Entrepeneur & Founder behind JD's Burgers, founded in August 2014. 3 years of Business Research was done before JD's Burgers was created. Recipe Perfection, Menu Research & Development, Business Travels to Asia including Japan, Korea, Taiwan, Hong Kong, Malaysia, Indonesia & Thailand, America, Hawaii & Australia all conducted by Dan himself. Bored of the Same Old Burger Scene? Dan thought so too. Thus, JD's Burgers was born. 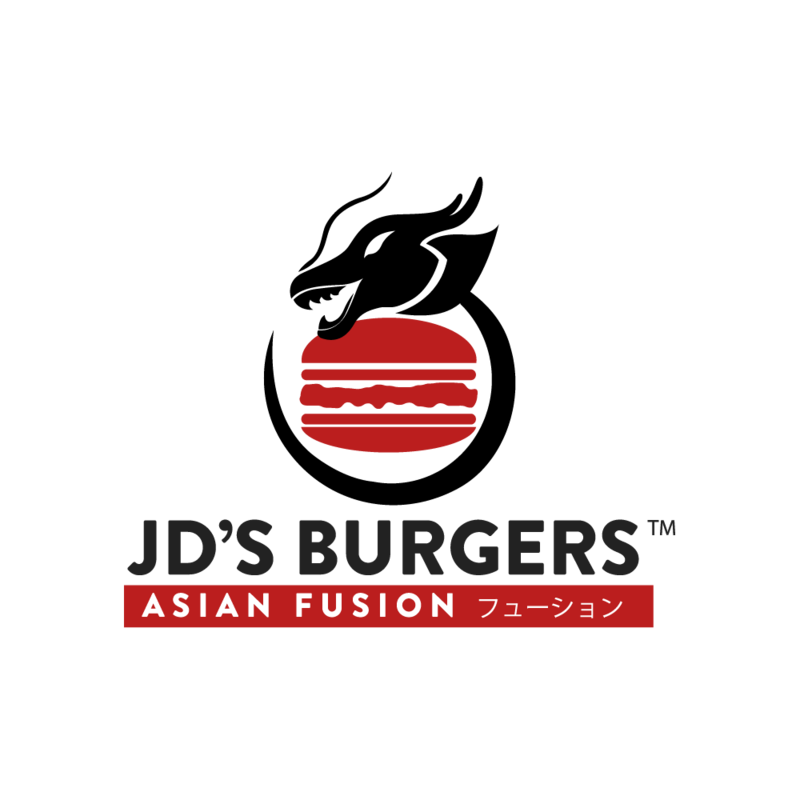 JD's Burgers was founded by Dan in August 2014 - to share his take on what he thinks is a Truly Asian Fusion Burger Experience that is unmatched by any other, unique only to JD's Burgers & The Very First & True Asian Fusion Burger Concept. 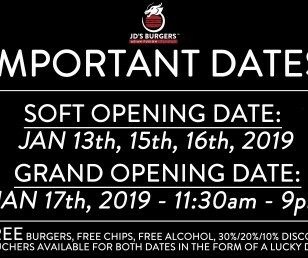 Being born and raised in Australia & obviously growing up in a Multicultural City with so many cultures fused into one country, is what really made JD's Burgers possible. 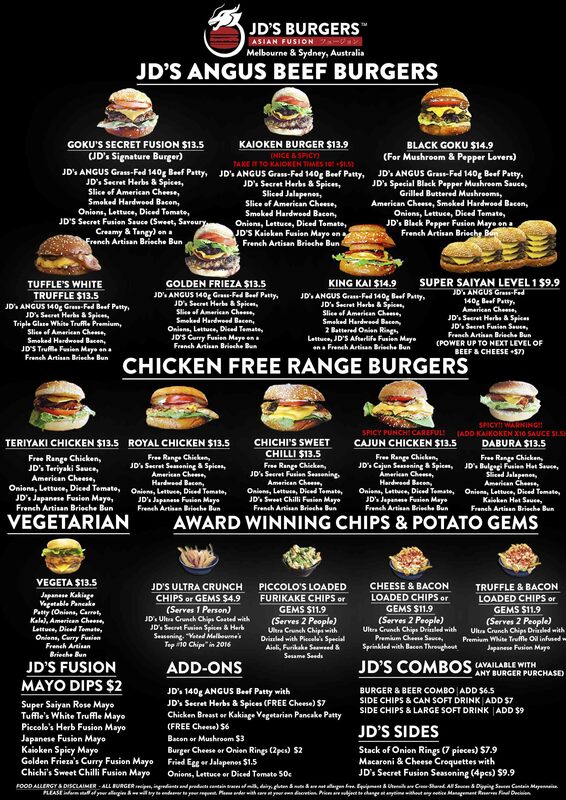 JD's Burgers is not just a business concept, but rather Dan's personality transformed into a delicious product & menu. 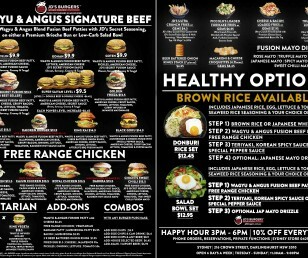 Daniel aims to serve Straight-Up, No Bull, High Quality Premium Burger without Sacrificing Quality nor Quantity. 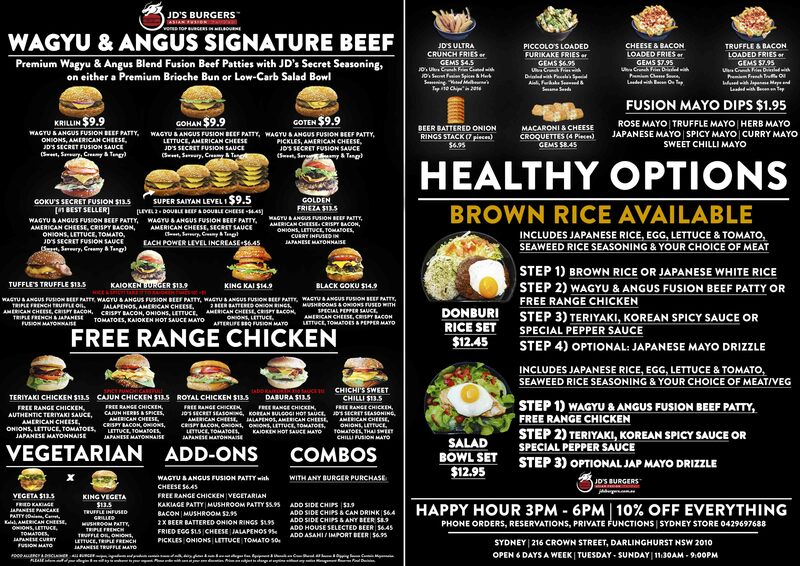 You'll be purchasing a unique Asian Fusion Burger with an Honest & Genuine Approach. You won't be charged extra for unnecessary extravagant views or fitouts that scream at you, nor obnoxious/pretentious waiters or an over-fitted restaurant with 'okay' overpriced food. Just an honest & genuine burger experience with a no-bull approach. The Priceless Experience Dan has attained from travelling America, Hawaii, Japan, Korea, Taiwan, Hong Kong, Thailand, Malaysia, Indonesia & All over Australia including Sydney, Melbourne, Perth, Gold Coast, New Zealand in search for the Best Burger & fused it all into a Unique Asian Fusion Concept like no other has done before. Hence, Dan has sourced the "Trademark flavour of each country famous to their own" & Created Burger formulas which have been tested & experimented over & over hundreds & hundreds of times until perfection for 2 years before opening up his first Concept Store which has now closed & now relocated to Mont Albert in January 2016 with its Dan who personally Developed the Recipes & Menu himself, and an upcoming Sydney Store coming in 2018/2019. So, why are you still reading the boring history of JD's Burgers? 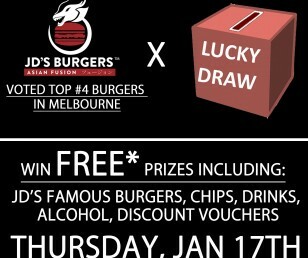 Do you have what it takes to Join the the Current Champions @ JD's Burgers Sydney? Did you know JD's Burgers Sydney Serves up Delicious Donburi like Teriyaki Beef Egg Donburi? 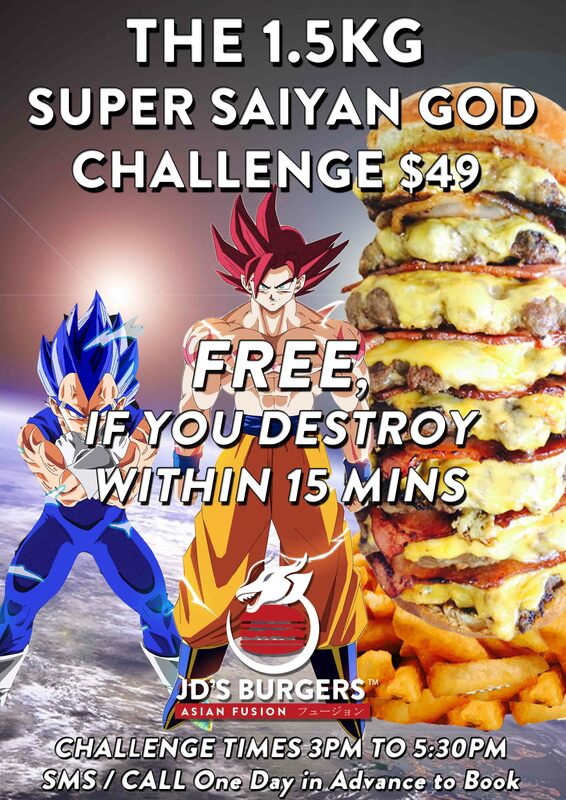 The 1.5KG Super Saiyan God Challenge @ Sydney! Defeated by @foodcoma_eats, @winnachickendinna_, @thewolfofeatstreet & @yuan.and.only! Meet Sydney's NEW VEGETARIAN Option! The King Vegeta with Triple Truffle Infused Mushroom Patty, French Truffle Oil. Look at this Beauty! 😍 Goku's Secret Fusion Burger with Secret Sauce, Juicy Wagyu & NEW BUNS! Mention this post & Receive 25% OFF YOUR BURGERS THIS WEEK! But Tbh in our case only when it’s 2kg worth of burgers or something. Big congrats to @foodcoma_eats for hitting 100k!! Ps this is the SuperSaiyin challenge at @jdsburgers. (NEW $9 Wagyu Range, New Healthy Salad & Brown Rice Options, Soft & Juicy Wagyu Patties, New Soft Buns after Feedback & Coffee Arriving Soon! 3) Announced on all our Social Media Accounts for all Eternal Fame & Glory! 4) DEFEATED? No Worries! Take them away for Breakfast, Lunch & Dinner the Next Day! Date changes are permittable however must be made 48 hours in advance before the time of booking All Challenges are limited to one challenger 1 time, per challenge, per person only & a 50% Non-refundable deposit will be taken to secure bookings. (During Weekend Peak Service Periods between 6:30pm to 8pm, There may or may not be someone to pickup the call). NOTE: During Busy Peak Periods (Friday 12:30pm - 1:30pm), we may not be able to Answer the Phone. Please come in-store / Call in Advance for the Freshest & Most Delicious Experience. FREE CHIPS WITH ALL BURGERS! Valid at Sydney Store Only! Just Show this Post to Cashier to Claim! Hurry! While Stocks Last! 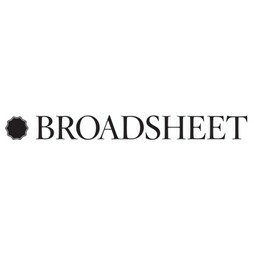 MELBOURNE Phone Orders Click Here (During Weekend Service Periods between 6:30pm to 8pm, There may or may not be someone to pickup the call. NOTE: During Busy Peak Periods, we may not be able to Answer the Phone. Please come in-store for the Freshest & Most Delicious Experience.